The Temple of Saturn (Latin: Templum Saturni or Aedes Saturnus, Italian: Tempio di Saturno) is a temple to the god Saturn in ancient Rome. The original dedication of a temple to Saturn was traditionally dated to 497 BC, but ancient writers disagreed greatly about the history of this site. The ruins of the temple stand at the foot of the Capitoline Hill in the western end of the Forum Romanum. According to ancient sources, the statue of the god in the interior was veiled and equipped with a scythe. The image was made of wood and filled with oil. The legs were covered with bands of wool which were removed only on December 17, the day of the Saturnalia. In Roman mythology, Saturn ruled during the Golden Age, and he continued to be associated with wealth. His temple housed the treasury (aerarium), where the Roman Republic's reserves of gold and silver were stored. The state archives and the insignia and official scale for the weighing of metals were also housed there. Later, the aerarium was moved to another building, and the archives transferred to the nearby Tabularium. The temple's podium, in concrete covered with travertine, was used for posting bills. Here's the our members favorite photos of "Ruins in Rome". 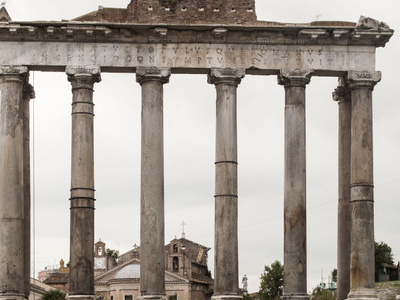 Upload your photo of Temple of Saturn!